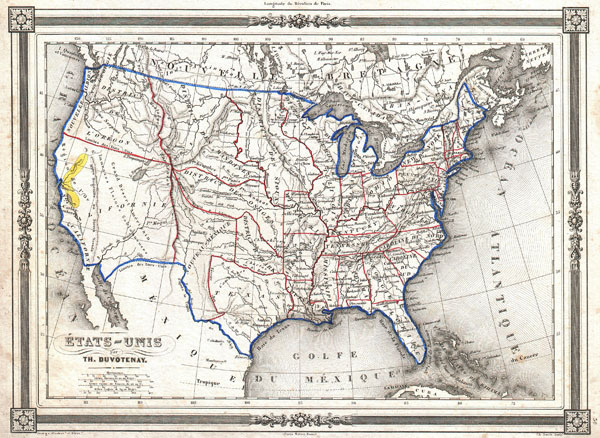 An uncommon and extremely attractive 1852 map of the United States by Th. Dovotenay. Depicts the United States at the height of the California Gold Rush and shortly after the annexation of Texas. While most of the eastern United States is well defined the territories of the transmississippi west are somewhat vague. California is shown as the large territory ceded by Mexico in 1849. The gold region along the Sacramento River is colored yellow and notated. Nouveau-Mexique (New Mexico) appears on the map in a very early state with its capital at Santa Fe. Encompassing much of the territory that is traditionally included as part of the c. 1850 Texas, especially the northern extension along the Green River; it is bounded on the west by the Rocky Mountains, the north by the Arkansas River and the east by Texas along the line established by the Adams-Onis treaty of 1819. Texas appears in an unusual configuration separated its c. 1850 western properties by the Adams-Onis treaty line. To the north of Nouveau-Mexique and Texas, Several American Indian territories are shows including the District des Mandanes, the District des Osages, the District d'Ozark, and the District Des Sioux. Labels the Great Salt Lake as Lake Teguayo after José Antonio de Alzate y Ramírez. Lake Teguayo is said by some to be the legendary homeland of the Aztecs. To the north of Lake Teguayo, today's Lake Utah is labeled Lake Timpanogos. Features a beautiful frame style border. Prepared by Th. Duvotenay for publication as plate no. 30 in Maison Basset's 1852 edition of the Atlas Illustre.